A while back, I was looking for suggestions for new features, and the excellent Mike Molcher put forward a 'where to start with' series: incorporating artists, writers, genres, themes, fashion in comics, great side-characters, etc., which sounded fun and useful (and easy to do!). I liked the idea of it- having done a couple of similar pieces- one on the work of French cartoonist, Bastien Vives, and one on suggested entry-points to manga (I'd like to expand on the latter soon, as I find navigating Japanese comics in the UK -even with the benefit of the internet- pretty difficult) already, particularly the notion that these shorter, list-type articles are hopefully as accessible and of interest to the general reader as well as the more familiar comics one. 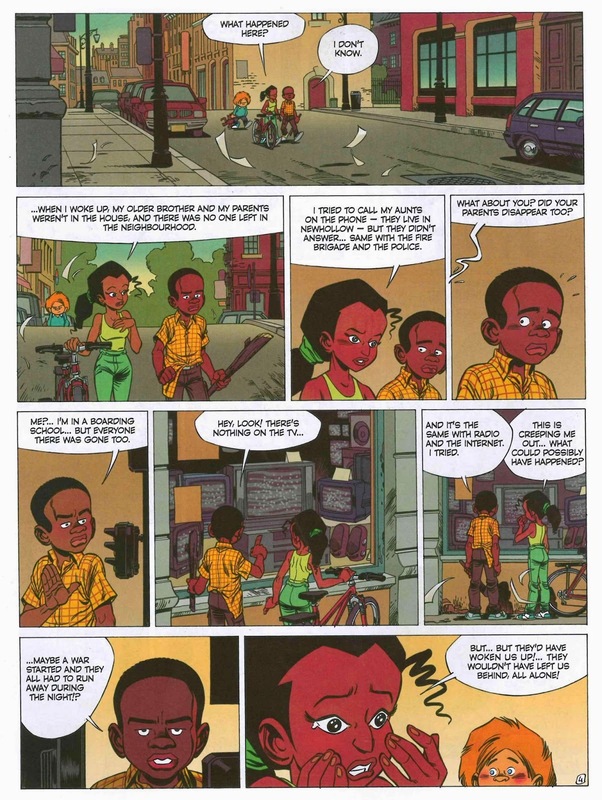 I've chosen to start with French comics writer Fabien Vehlmann. Vehlmann, who got his big break in comics when he was hired as a writer for Spirou magazine in 1997- and hasn't really looked back since, is an author whose work I think about quite often; I find him similar to Naoki Urasawa in that he's able to write very different stories that jump from genre to genre and beyond, in an eminently engaging manner. 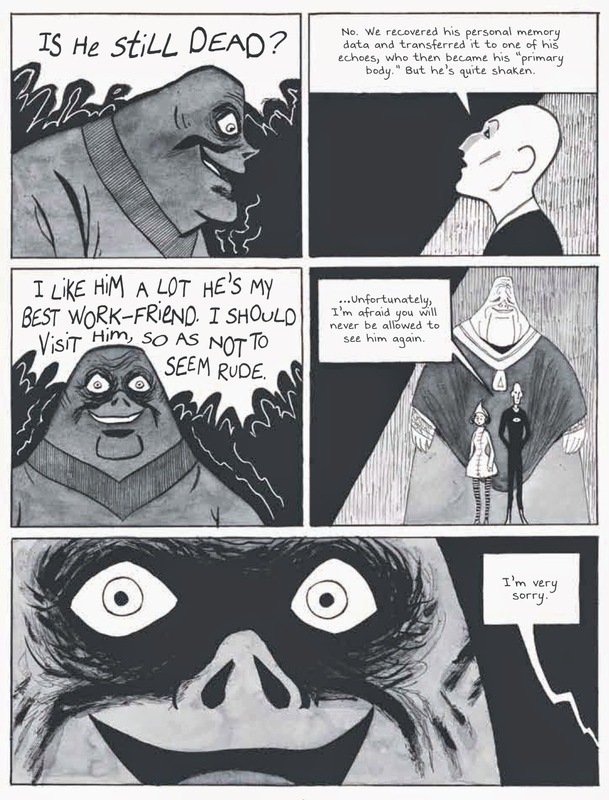 Unlike Urasawa, who illustrates his own work, Vehlmann either stands out or flies under the radar -depending on your perspective- because he collaborates with a variety of exceptionally good illustrators; there are no distinct running themes in his work, and because it looks so different each time, with a lot of the tone and feel provided by the artists, it can be easy to overlook who it's written by. 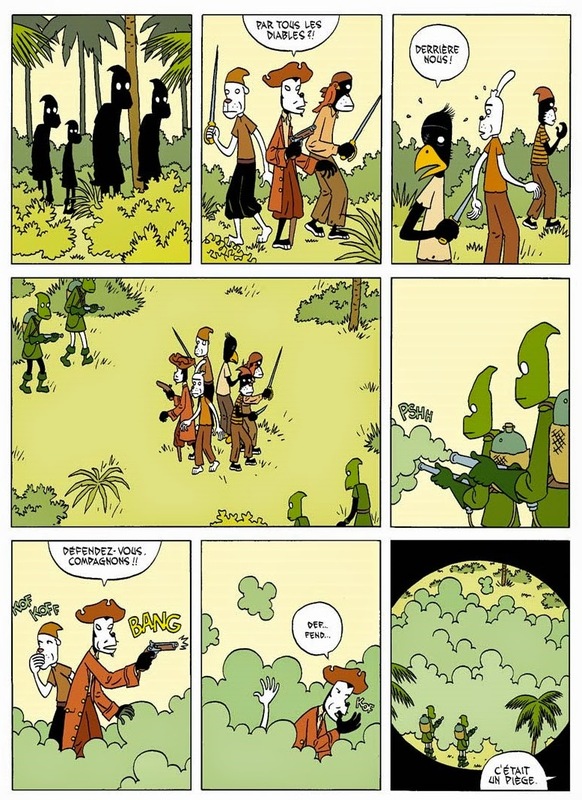 I admire that he wants to tell a range of diverse stories: sci-fi, Victorian murder mysteries, pirate tales, apocalyptic children's bildungsromans- even as perhaps the comics scene in France facilitates that to a greater degree, and he appears to be someone who truly thrives on collaboration. There are writers who stick to what they're good at, and those who write the same book over and over, but Vehlmann seems committed to simply writing strong and interesting stories. Here, I'm going to focus on the six of his English language translated works. 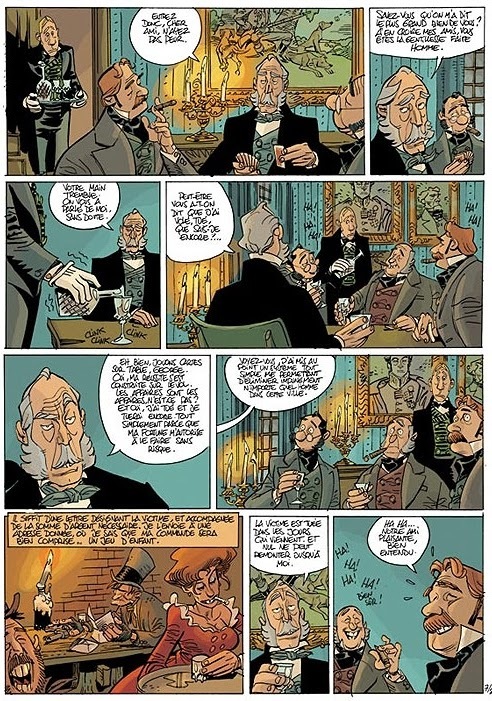 Green Manor (series) with Denis Bodart, Cinebook: Green Manor is a great, fun, Victorian murder mystery series with a bit of a twist: the narrator of these tales is a butler locked up in an asylum, who begins spilling his guts when he's visited by a curious policeman. The titular Green Manor is a gentleman's club for rich, powerful -mainly old- men of various professions, who sit around telling each other stories involving corruption and blood, setting up absurd wagers, competing with one another, and generally being off-handedly dastardly towards pretty much everyone. As you can see from the cover and art above, Bodart's spindly, fine lines are perfectly suited to the material and era; the books are hugely enjoyable and gleefully revel in the awfulness of these privileged men, while the dash of Conan-Doyle in solving the impenetrable mysteries provides another facet of intrigue. 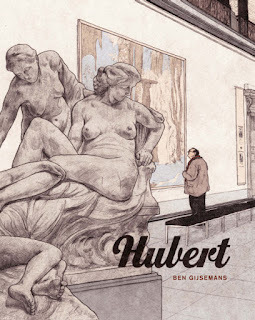 There have been two volumes published in English so far, courtesy of the excellent Cinebook, available very cheaply and serves as an excellent place to start with Vehlmann's oeuvre. He and Bodart are currently working on new Green Manor stories in French, which I'm hoping will be picked up quickly once it's wrapped. 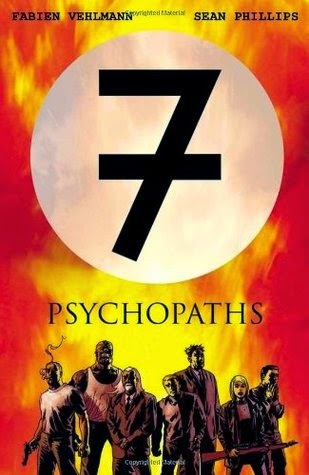 7 Psychopaths with Sean Phillips, Boom! 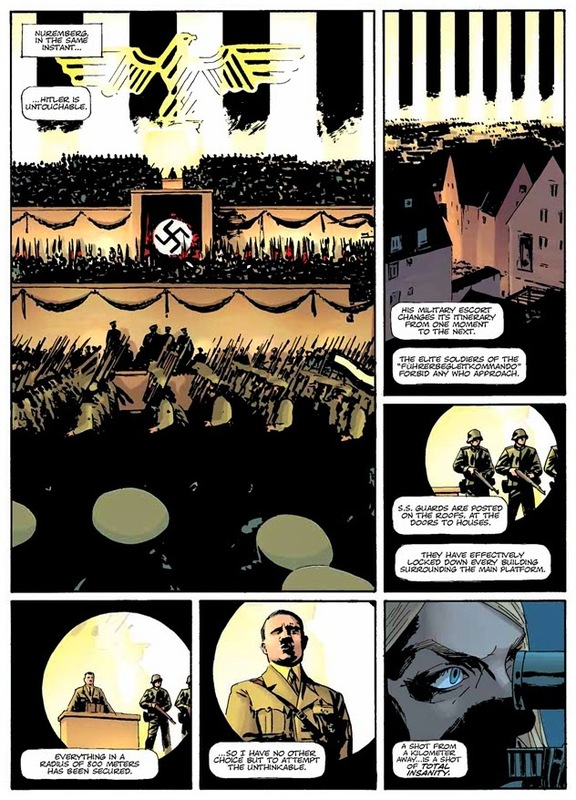 : A mini-series illustrated by none other than Sean Phillips (Criminal, Fatale), and unconnected to the film of the same name, 7 Psychopaths is the story of 7 people bought together for a singular, and fictitiously popular, mission: to assassinate Hitler. Set in World War II, with the Allies desperate to end the war, the only solution that seems tenable is to get at the root of the poison. Of course it's not going to take 'normal' people but a hodge podge of social outcasts and 'crazies' who are now the only hope the world has. I guess this is one of the aspects that makes me appreciate Vehlmann as a writer; everything about the above blurb sounds very done, very rote, seen-it-before, but he still manages to be very readable and entertaining. 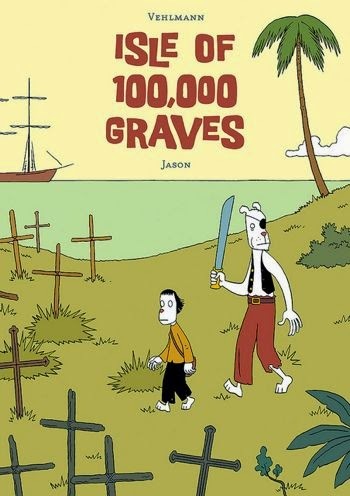 The Isle of 10000 Graves with Jason, Fantagraphics: Part pirate tale, part Treasure Island, part strange coming of age tale, part revenge story, The Isle of 100,00 Graves is a great example of a collaborative work. It's rare that Jason works with writers, and the blend of his dead-pan humour with Vehlmann's easy narration makes for a singular reading experience. Jason's trademark anthropomorphic blank eyed figures are imbued with a curious warmth, even as he controls the underlying tone and thrust of the story. Gwenny journeys to the mysterious Isle of 100,000 Graves with a shipful of dodgy pirates via a map found by her father five years ago before he disappeared, bent on finding both him and the mysterious treasures the island is supposed to yield. But the island isn't named lightly or in hyperbole; it's home to a secret school for executioners and torturers, where young pupils are taught the many painful ways of extracting information from people before putting an end to them once and for all. So an influx of uninvited visitors as they near the completion of their studies is a tricky thing indeed... Surprisingly sweet. Last Days of an Immortal with Gwen De Bonneval: A philosophical sci-fi set in the distant future, in a galaxy teeming with an array of alien races as well as humans, and in which people can live for hundreds of years, and are also able to replicate themselves as 'echoes' and live multiple lives simultaneously, before being absorbing back into the original host body and gathering all the memories in one place. Elijah is a member of the 'Philosophical Police,' who must solve conflicts that arise out of ignorance of the Other. 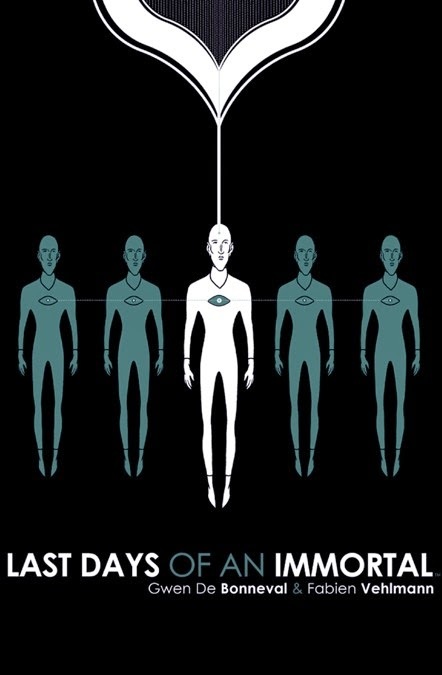 Two species are fighting a war with roots in a crime committed centuries ago, and Elijah must solve the crime and bring peace between their species before war errupts, while also confronting his own immortality in a world where science provides access to eternal life. Beautiful Darkness, with Kerascoet, Drawn and Quarterly: Perhaps the title with which most people will be familiar, I believe Vehlmann had more of a backseat role in Beautiful Darkness, as the original idea and concepts were created by Marie Pommepuy (she and husband Sebastian Cosset work under the name Kerascoet), and he assisted with scripting and refining the narrative. 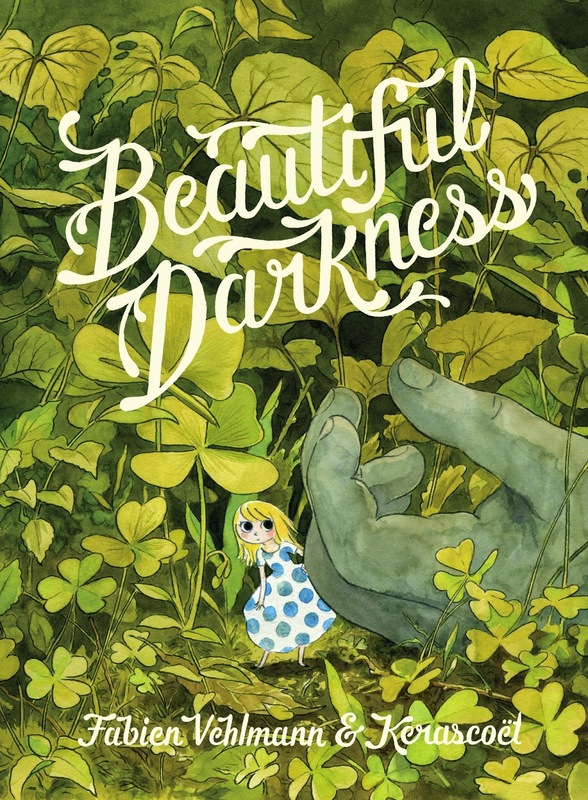 I've written about Beautiful Darkness pretty extensively: there's a review here, and a more in-depth deconstruction examining some of the themes and possible interpretations here. Widely acknowledges as one of the best books of 2014, it follows a group of tiny Borrower-esqe people as they attempt to survive in the woods with winter drawing in. 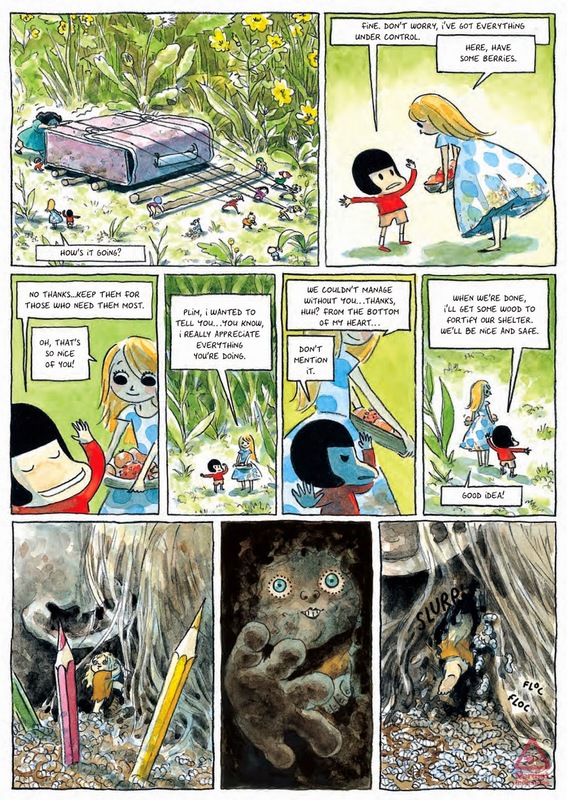 And near by, the dead body of a young human girl lies decomposing... An examination of society, constructs, roles, their effect before and after removal, and the dangers of idealism, beautifully, uncomfortably illustrated by Kerascoet, it's an astonishing, unblinking work which will no doubt become a classic. Alone/Seuls (series) with Bruno Gazzotti, Cinebook: Probably my favourite -and the strongest- Vehlmann to date, Alone [Seuls]is an ongoing series in its original French (on its 8th volume now) which Cinebook are translating into English; books 1 and 2 were released last year, with 3 and 4 scheduled for publication in 2015. 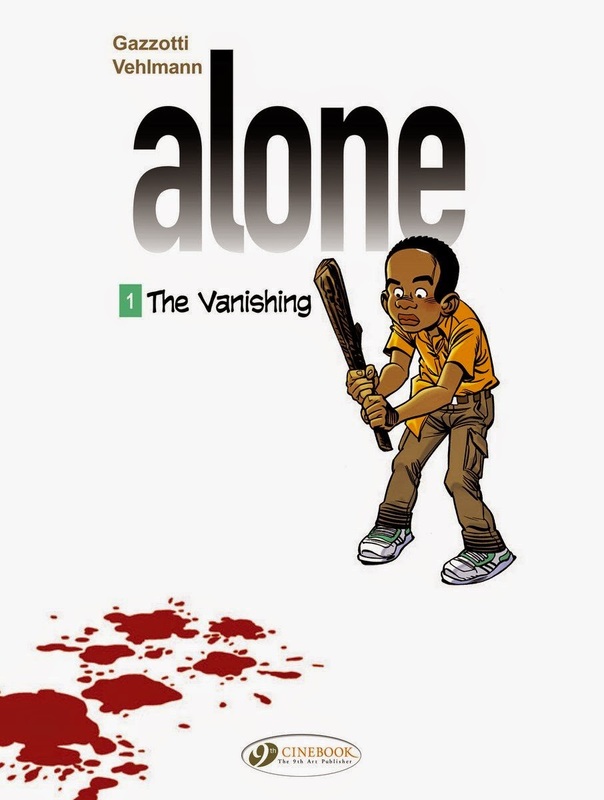 Five very different children with nothing in common other than the fact that they live in the same town, wake up one day to find it empty: all the people, themselves excluded have vanished. Vehlmann veers from the easy route of 'how fun- no parents!' although there is sometimes, realistically, an element of that; instead focusing on the fear and eeriness as the kids struggle to survive and investigate what has happened. The characterisation is brilliant here, without condescension or talking down, the children are all multi-facted and very well realised. Gazzotti's cartoony realsim contributes deftly to the whole scenario, and it's simply one of my most anticipated series at the moment. It is genuinely criminally underlooked, and I'd urge you to read it immediately. This is another one I've championed quite a bit: you can find more details on the series with quotes from Vehlmann and Gazzotti in a 'general look' article here, a review of Book 1: The Vanishing here, and Book 2: Master of Knives here. Very pleased to hear there is going to be some new Green Manor stories.